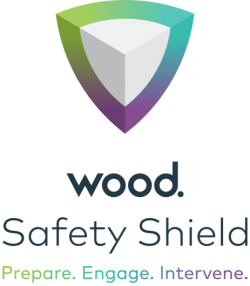 Safety Shield is Wood’s new approach to safety. It will help us communicate, engage and simplify our safety systems, while including the best of our heritage safety programmes, Safety Cocoon and Beyond Zero, which will be retired in 2019. The Safety Shield has three parts: prepare, engage and intervene. Each part must be in place for the shield to protect. Experience has taught us that incidents happen because one or more of these elements is weak or missing. Safety Shield is founded in Wood’s values: commitment, care and courage. We need commitment to prepare properly, care to engage effectively and courage to intervene appropriately. A shield can only protect when it is used properly, and we all have a duty (not a ‘choice’) to ‘raise our Safety Shield’, to prepare, engage and intervene. Preparation starts with a commitment between Wood and its employees. Wood provides the tools and resources to do the job safety and you must use them properly. Engaging means we take the time and effort to make sure our safe systems of work are in place and kept in place all through the job. Intervention keeps us on the right track and aware of risks, that’s why we need intervention tools to help keep the job safe, check to see that everything is going well, help us learn and improve and in some cases stop the job if it’s unsafe. Safety Shield will help us simplify safety management and drive consistency throughout our business. We will also use our Safety Shield for awareness and training, organisation and monitoring of our management system, and for recognising individuals. Everyone every day must raise the Safety Shield to keep us all safe! There are a number of tools, systems and initiatives that comprise the Safety Shield, one of which is our Life Saving Rules.